The kitchen, positioned physically and figuratively at the heart of the home, is where family members gathered at the table to share a meal and spend time together. In the late 19th Century, everyday household objects were decorated to enhance the space in which these social encounters occurred. In the early 1880s when John S. Donald brought his city bride, Vona, to his farm in the Town of Springdale, the house was updated and redecorated in the popular late Victorian style of the period. 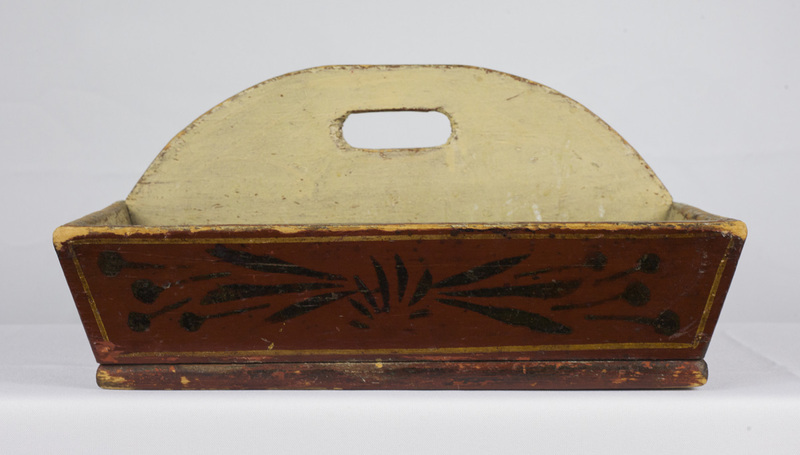 Even this utilitarian cutlery box received a newly decorated surface, ornamented with painted stencil designs to compliment the new décor of the Donald farmhouse. The wooden cutlery box from the Donald family kitchen is one of many pieces donated to the historical society from the estate of Delma Donald Woodburn, Reverend James Donald’s great-granddaughter. It was made used on the Donald family farm during the late 1800’s, possibly handmade by the Reverend or one of his sons and decorated by feminine hands. Overall the box is simply designed, constructed, and decorated, but appears to have several decades of use in storing cutlery. Constructed of a hard maple or oak, the cutlery box was carved and nailed, measuring approximately 12”x10”x7.5”. It is an open box with four canted sides, and a bipartite compartments, separated by an arched central divider with a cut-out handle. Its interior sides and divider are painted white, and the exterior sides are painted red with gold stripes and black stencils of a floral design. This kind of craft was common among young women, most of the times inspired by magazines with step-by step graphic tutorials. These publications helped impoving the household aesthetics with the Make-Do practice, combined with family traditions and heritage. The residence of the Donald family was an emblematic representation of life in the early 20th century Wisconsin through its many objects and artifacts. A historical object that is seemingly ordinary, like the Donald family’s cutlery box, can help uncover an entire history surrounding its existence, such as traditions in dining, social status through one’s property, and the creation of containers for intended items. This is one of the dozens of artifacts that came to the Mt. Horeb Area Historical Society from the estate of Delma Donald Woodburn (1899-2001), who carefully documented and preserved the material heritage of her family’s life in Mount Horeb and Madison, Wisconsin. The artifacts span several generations, beginning with two early pioneer families who came to the rural Mount Horeb area from New York state in 1855–William Sweet and Sally Clark Sweet and Reverend James Donald and Margaret Strong Donald. By this time in the 19th century, women’s magazines promoted household craft and decorations. Young ladies were expected to learn domestic skills and even common household goods became a pallet for artistic expression. Parlors and family spaces were filled with this kind of craft, making her home more inviting and following the Victorian magazine arts of the time. Vona Donald chose bucolic rural winter scenes to enhance and decorate her environment. With paint and inspiration, the rural landscapes were one of the frequent motifs that brought character to these daily objects.